Great work as usual, Cynthia - thanks. On 'mystery': perhaps take a look at how Roger Martin uses the term, in contrast with 'heuristic' and 'algorithm', in his book 'Design Thinking'. 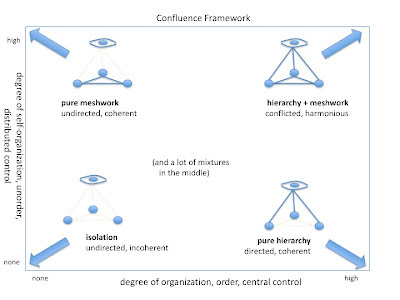 In classic Cynefin terms, you could say that he places 'mystery' in the border-region between Chaotic and Complex, 'heuristic' between Complex and Complicated, and 'algorithm' between Complicated and Simple (i.e. rule-bound). Might well be useful for cross-comparison here. 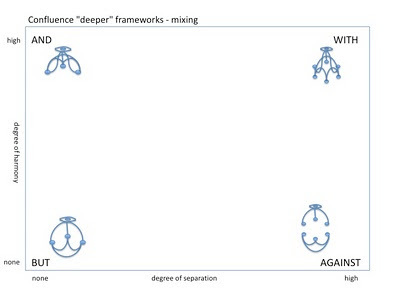 On 'agency': another way to put 'degree of agency' in your frame might be inanimate (i.e. 'natural forces') versus animate (result of conscious choices, human or otherwise, as you say). We could note, for example, that 'Caisson disease' was _not_ attributed to malign spirits etc - in other words even at the earliest stage it was assumed to be the result of some unknown yet natural cause. 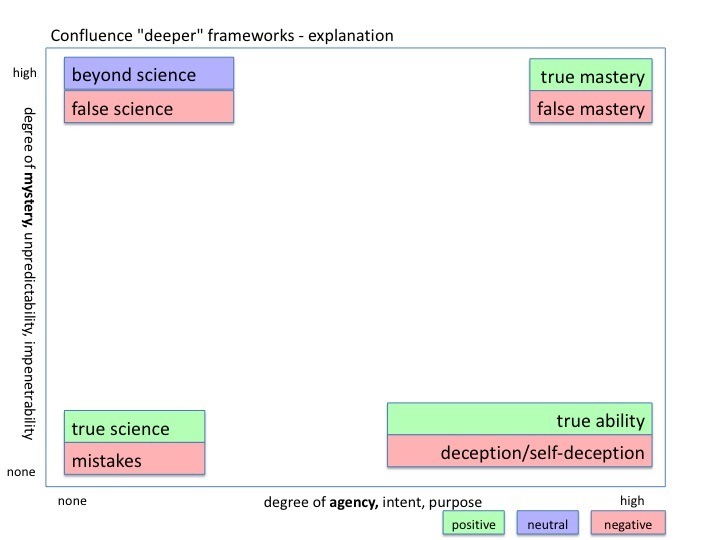 Hence in terms of your model, a natural-scientist would tend to look for explanations over on the left; a social-scientist (or, for that matter, a religious person) would tend to look for explanations over on the right. One difference between our approaches, perhaps, is that (as you say above) your aim is to _explain_ explanations, whereas I'm more looking for ways to _use_ explanations - the Scientist versus the Technologist, if you like. In a technology perspective, explanations and other beliefs are tools that enable different choice: to quote psychologist Stan Gooch, "things not only have to be seen to be believed, but also have to be believed to be seen". So whilst to some people the focus in assessing a model is whether or not it is 'true', I'm more concerned about whether it's _useful_, or effective, for any given purpose - which, recursively, means that I also need some kind of frame in which to identify the current purpose! Hence two other themes here: recursion and dynamics. Recursion occurs when we use the frame to explore itself (or, in this case, explain itself). One of the key points in a frame about explanation is repeatability and predictability: the whole point of an explanation is to predict what would happen again under equivalent circumstances. 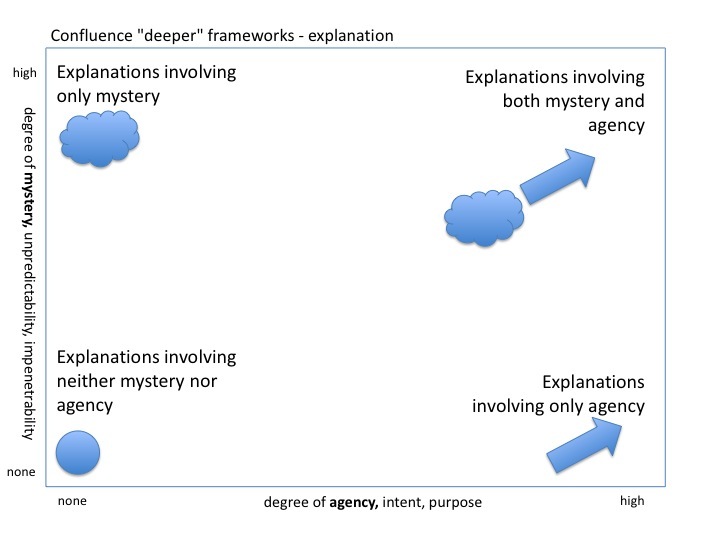 So in scientific terms any unique event is a 'mystery of mysteries', because there's no repetition; in religious terms the same event might be deemed a 'mystery of agency', evidence of the hand of some discarnate entity; and so on. 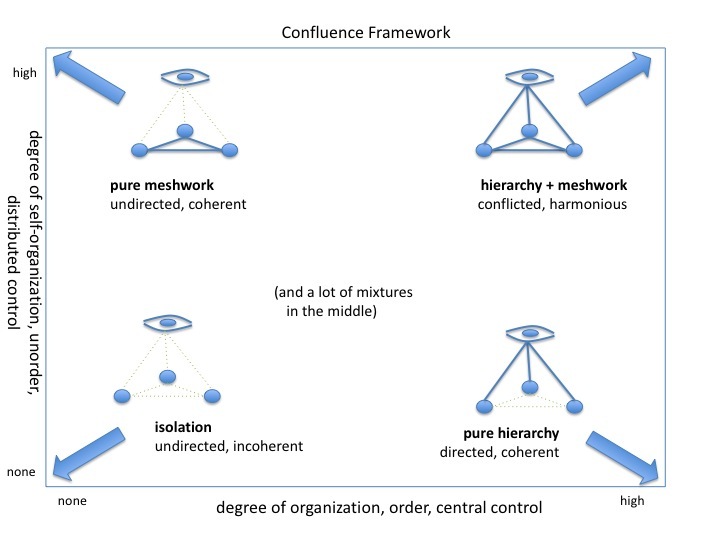 Like many enterprise-architects, I've always found this kind of recursion to be one of the most powerful and practical ways to use the Cynefin frame; it seems it could well be useful here. 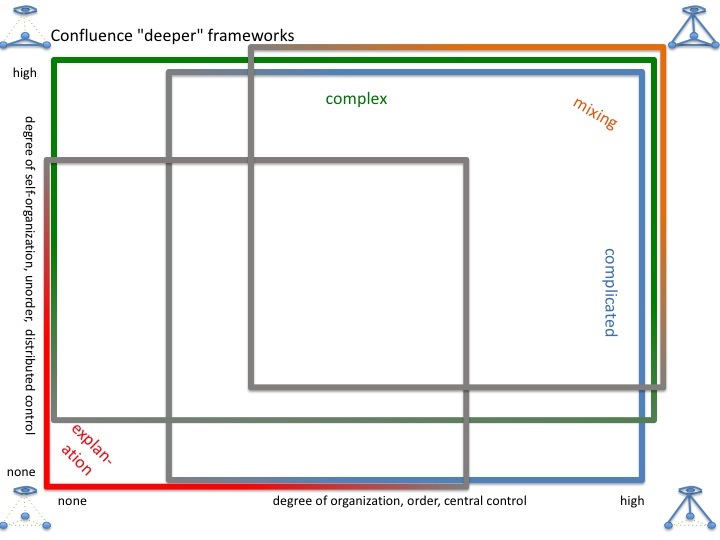 And as with Cynefin, the dynamics would seem to be extremely important here - using the Confluence frame to explain and map the means and/or sequence via which people _change_ their explanations. 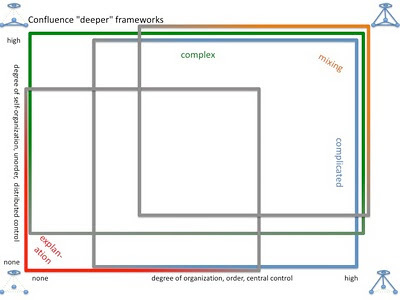 In your last diagram above, each of your 'colour-change' relations is also a dynamic - not solely 'positions', but how someone might move from one position to another. Which again is often partly recursive, because we can use the structure of the frame to map ('explain') each step in the transition. One real point of concern, though, is your colour-code, which in essence is a scale from 'grounded belief' ('true') to 'ungrounded belief' ('false'). The way you've framed that does kind of reflect your preference for scientific over technology over anything else, and again doesn't seem to allow for natural uniqueness or personal difference of experience and interpretation - would perhaps be wise to be wary of the tendency to subjective feedback for reinforcement of (literal) prejudice in the way it's currently framed? Perhaps needs more emphasis that it's about subjective _belief_ rather than objective 'fact' - e.g. that green represents a _belief_ that something is true, and red likewise a belief that something is false, rather than that it 'is' or 'is not' true or false in any objective sense. 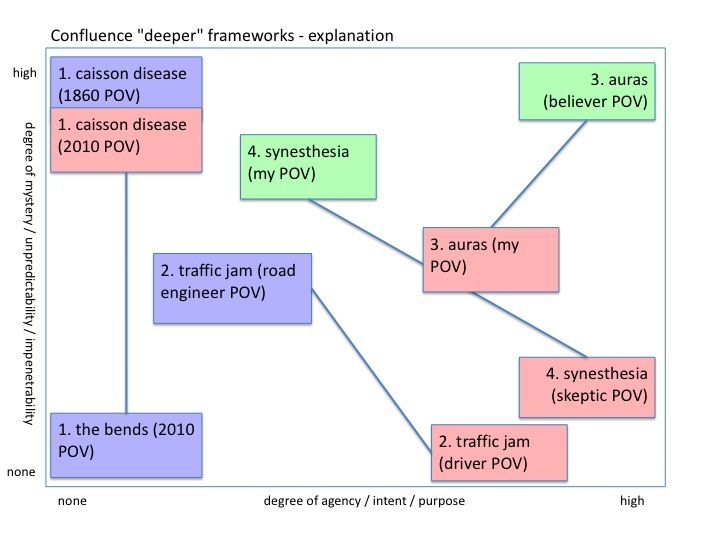 I'll use your point about synaesthesia versus auras as an example for all of this. The _experience_ (i.e. personal-belief/explanation) of synaesthesia is well-documented: for example, almost the entire terminology of wine assumes or implies some form of synaesthesia. Credible explanations exist, mainly centred around various views of 'cross-wiring' in the brain and suchlike. The catch is that it is a highly _personal_ experience: hence easy for those who _don't_ experience it to place it under 'false agency' (upper right on your diagram). 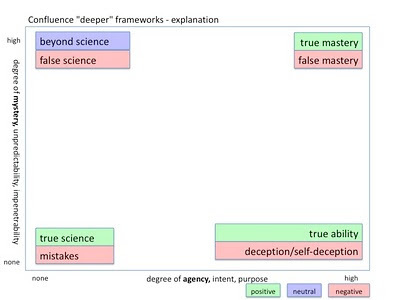 To move it to 'scientific explanation' (lower-left) implies or requires strong dynamic forces - especially since, given that it is a near-unique _personal_ experience or attribute, there is little to no way for them to experience it themselves. Synaesthesia usually implies one sense being used as a _direct proxy_ for another sense: colour for sound, for example, or texture for taste. 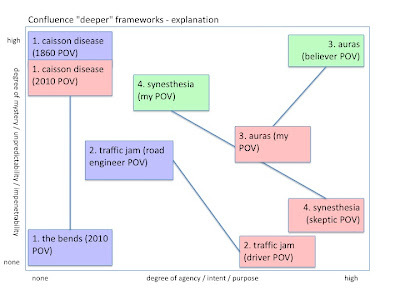 But so-called 'auras' seem to be somewhat different: in my understanding and (very limited) personal experience of the respective phenomena, they seem more an _indirect proxy_ for merged or interpreted information - not a direct cross-sensing but a perceptual _overlay_, much like current development of so-called 'augmented reality' on mobile systems. Hence, for example, perceived-colour as a proxy for overall health. Something similar occurs in dowsing, for example, where small movements of the hands are leveraged and interpreted as a proxy for other information provided by weighted-sum cross-merging of other information. The catch in both cases is that the source-information may be any combination of objective or subjective - in other words, anywhere on your green/red ('true'/'false') spectrum. Which leaves the entire phenomena wide open for interpretation all the way from false-positive ('newage') to false-negative ('Skeptic'). Probably the only way out of that impasse is personal experience - which again may make little sense to others (i.e. placing it at the 'high-unpredictability' or upper section of your frame). Under those circumstances, any question of 'real' versus 'imaginary' makes little sense: any boundaries between them becomes blurred (your 'And' versus 'But', in your 'Mixed' version of the frame above), so much so that 'real _and_ imaginary' is the only term that does make sense. It's not repeatable (or at least, I _hope_ it isn't! :-) ), and by definition it's subjective, yet in those specific terms the respective feelings and experiences _are_ themselves 'facts' - whereas any interpretations (i.e. 'explanations') are not. 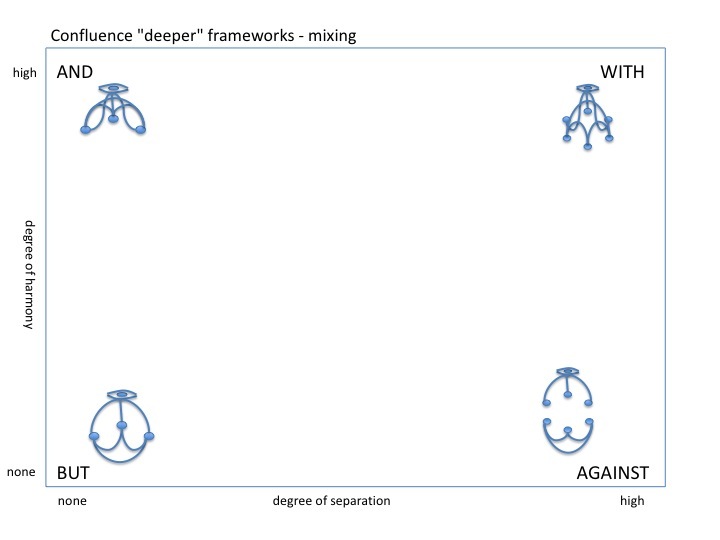 So to make the Confluence frame even more useful, it would seem worthwhile to explore how to recurse at least one more level, where we can use 'subjective' versus 'objective' to map and 'explain' the explanations and dynamics of explanations.